Ex Hot Girl: Adjusting the calories, y'all. Well, first of all, I'll report my calorie intake since the 22nd. 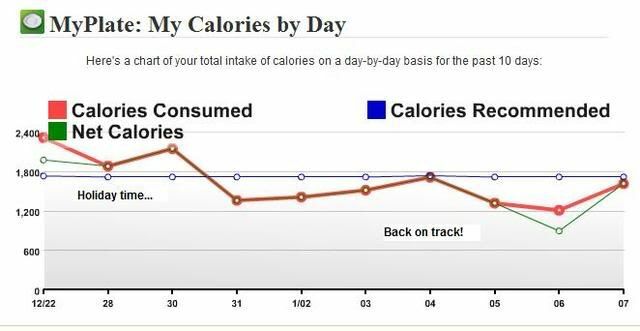 I decided to revisit my calorie goals for losing 1-2 pounds per week, which is HEALTHY. Livestrong.com was telling me that my recommended intake to lose 2 lbs per week was 1700/day. That's just too high. So, I'm going to see if I can take it down another 500 per day and make my daily goal 1200 calories. That's higher than the 1127/day above, but it's a nice round number. I have also read in many places and it seems to be the general consensus that consuming 1200 calories each day has been shown to be nutritious, yet allows for the calorie deficit most people require for losing weight. Standard diet programs recommended by medical professionals and nutritionists use 1200 calories as a foundation for developing meal plans. I have to make sure that I continue to strive for accurate calorie recording. I found this on thedietchannel.com.